SAN NARCISO, Calif. (Bennington Vale Evening Transcript) -- After another haphazard and hasty rush to promote Republican Party messaging on Twitter, the GOP removed an offensive tweet only hours ago that read: "Free at last! Kenyan-Muslim-socialist-Madrassa-food stamp-crazed dictator dies." The post was deleted by administrators of the RNC (@GOP) account on learning that iconic South African peace activist Nelson Mandela had died Thursday, not U.S. President Barack Obama. 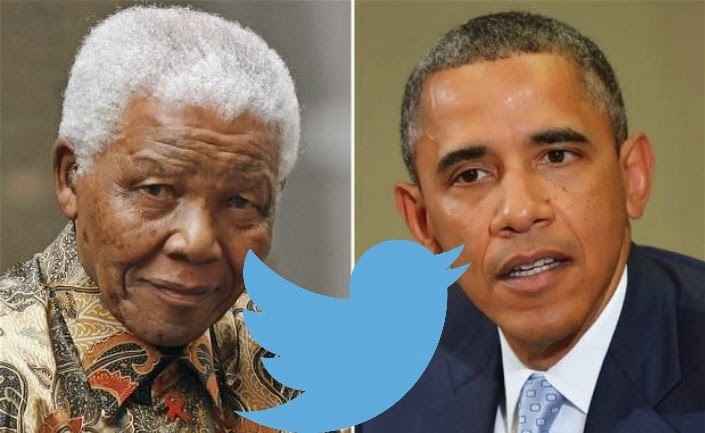 Defending the confused Mandela-Obama tweet, RNC spokespeople confessed to poor judgment but explained that the similarities between the two groundbreaking presidents led to an error "any reasonable person could have made when the news broke." The retraction came on the heels of a similarly embarrassing blunder that occurred on December 1 when the GOP implied that Rosa Parks had ended racism: "Today we remember Rosa Parks’ bold stand and her role in ending racism." Four hours after the tweet appeared, RNC aides corrected the post to clarify that Rosa Parks was an instrumental historical figure who, as an angry, anti-establishment black woman, forced complacent politicians to publicly acknowledge the uncomfortable reality of ongoing gender and racial inequality in the country. Nelson Mandela spent 27 years in prison after being convicted of treason by the white minority government, but he achieved a peaceful and unprecedented end to white rule by negotiating with his captors following his release in 1990. Current President Jacob Zuma described Mandela's passing as "the moment of our deepest sorrow…[the Mandela family] have sacrificed much and endured much so that our people could be free." Nelson Mandela was 95. As for the Twitter mixup, prominent conservatives attributed the inappropriate tweet to uncanny biographical parallels between Nelson Mandela and Barack Obama. The situation was exacerbated, they claimed, by the immediacy for information that has been fostered by the Internet, social media and a tireless 24-hour news cycle, all of which led to the hurried and unvetted nature of the post. Carlisle Olden-Whitely, chairman of San Narciso’s foremost conservative political action committee -- the Association of Republican Seniors, Wives, Young Professionals and Entrepreneurs (ARSWYPE) -- called the tweet "a regrettable Biden-esque gaffe," but said he "couldn't see things shaking out any differently given the circumstances." "Just consider the eerie similarities," Olden-Whitely asked, begging the public's indulgence. "Here we are presented with a blurred portrait of two young, militant, anti-colonialist African nationals who studied law and then parlayed that training to aggressive advocacy for people they considered to be oppressed or somehow disenfranchised by the accepted system of governance. Mandela was repeatedly accused of sedition. Obama, while not accused, is certainly guilty of it. And Mandela was arrested for treason, an effort we've been expending tremendous amounts of energy on with regard to Obama." Olden-Whitely also noted that both men upset their existing governments' fiscal stability to introduce liberal economic reforms, measures to encourage land reform and homeownership, programs to combat poverty that enabled welfare abuse, and expansions of dangerous, democratically disastrous healthcare services. Both men were controversial figures, denounced by right-wing critics as terrorist and communist sympathizers. Mandela and Obama also became the first black presidents of their respective nations, each facilitating disruptive policies of discrimination against a conservative white majority that had built a prosperous empire from primitive lands -- lands that would have been left to fester by the savage, indigenous tribes they found there upon their arrival. "The only real difference in the men comes from their tenure as heads of state," Olden-Whitely said. "Mandela served only one term, making him the far more palatable and less ruinous of the pair." As a corollary, Olden-Whitely also referenced President Obama's acknowledgment on Thursday that he lived with his Kenyan uncle in the 1980s while preparing for law school, an admission that contradicted a year-old statement from the White House that said no record existed of the two ever having met. The reversal, Olden-Whitely averred, essentially validated Obama's African birth. "We know the president's a big fat liar, so I'm certain he'll apologize toward the end of his term to all the birthers he slandered during his presidency," he stated. Other representatives from the RNC apologized for the erroneous tweet and expressed their condolences to the families and supporters of Nelson Mandela, a man they described as "a cultural touchstone in Africa and an influential force for change in a country we have very little to do with and whose strife we can easily ignore because it poses no threat to our economic interests, despite occasional and mildly annoying emails from deposed Nigerian royals begging for money."